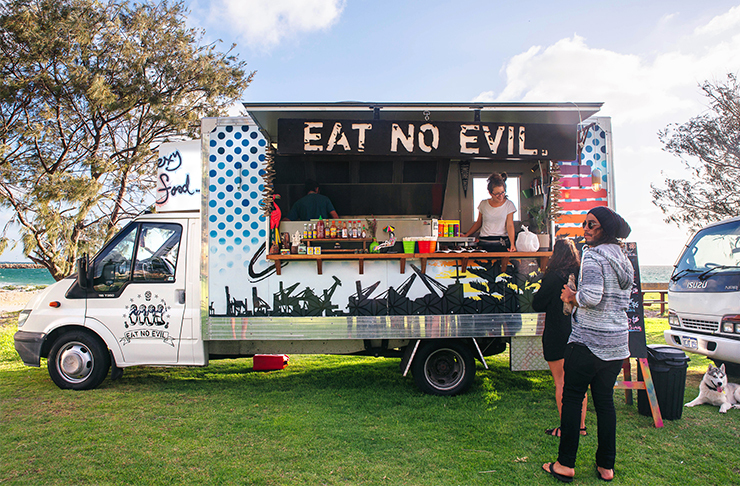 This week we catch up with Ben and Ben, the guys behind the delicious and nutritious food truck, Eat No Evil. Chances are you’ve probably seen them before, as these guys are in high demand, feeding people at events like the Fringe World Festival, Perth International Arts Festival and Fremantle’s South Beach Sunset Markets. They also happen to be the creators of the best gluten-free chocolate brownie you will ever encounter (fact). 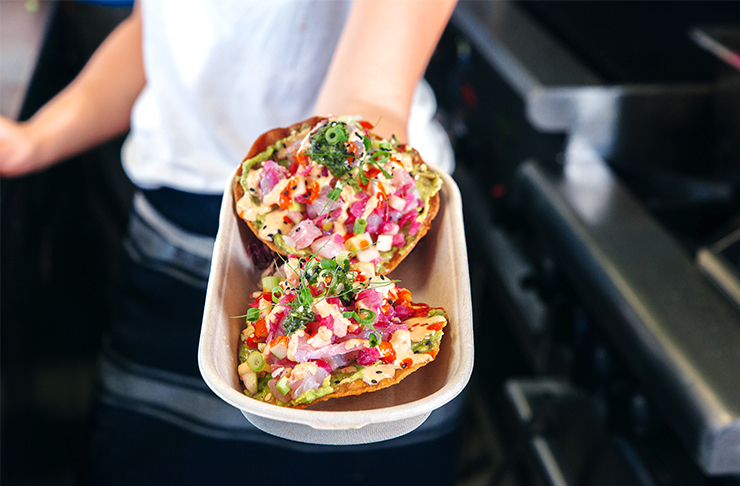 We sat down with the Bens to find out what they like to dish up, how they got started in the food truck biz and where they go for a healthy treat. Ben Foss: I’ve been working in kitchens for the last 10 years in Perth, Denmark and overseas. I have a bit of an affinity with Fremantle; I love the lifestyle here, being by the beach, the people and the general vibe, and I’ve always wanted to have a business here. Ben French: I’ve worked quite a few jobs over the years, from a lead singer in rock bands, head barman in London, to scaffolding in the North of WA—pretty diverse! But I love Freo as well and have been drawn to the lifestyle here. Eat No Evil has allowed me to live and grow here. Eat No Evil for us is a way of life that gives us the amazing opportunity to cook food that we are passionate about, and live a lifestyle that always brings something fresh and exciting and challenging to sink our teeth into. We were both in a bit of a lost place to be honest, and wanted to start something fresh. We both had a lot of drive and had seen the food truck phenomenon really take off in other countries, so wanted to see if we could push it here. We started with just a little decked-out van that we wheeled out to a few market stalls, and tried to do as much as we could. From there it really took off, and moving on to the big truck we have now was a natural progression. We wanted to help change the face of street food in Perth, and we think it’s coming along really well. Have you both always been in to healthy eating and cooking? We are both very active people, we love eating fresh local food that tastes good and makes you feel good. We have a lifestyle that revolves around the coast and the ocean, and we think that in turn gives you a love and respect for the produce that is home-grown here in our State. We believe that the best way to eat is to source local ingredients, as they are the freshest and best quality. And also focus on quick, easy meals that give you exactly what your body needs. What does a regular day look like for you guys? We are usually up early taking the dogs down to South Beach in Fremantle, followed by a quick coffee at our local cafe, The Little Concept, and then into the day. The upkeep of the food truck and equipment is massive, so one of us will go about getting it all ready for the night’s trade, while the other will do a quick run to the markets and then prep the menu. Whether we are cooking for a wedding or a night at South Beach, we try to make everything from scratch and use mostly fresh ingredients—so prep is a huge part of our process and has to be done every day. Music helps though—good tunes are very important in our kitchen to keep the hours rolling on while you’re slicing and dicing. The customer interaction is the part of our job we get the most satisfaction from. We get to make and serve the food right in front of the customer, so a bit of banter is usually on the cards. It’s always heart-warming to see the same faces coming back and supporting us. We get to work in amazing locations as well. The sunsets at South Beach are awesome, and getting to travel to Margaret River to do the catering for weddings isn’t too bad either! We couldn’t really tell you! The last three years have been a bit of a whirlwind for us and we love every day of it. We’re always learning and challenging ourselves so it keeps it interesting and we don’t really think about doing anything else. But if we really had to pick something other than Eat No Evil—maybe chasing waves every day in Mexico? That wouldn’t be a bad option! What’s your favourite thing to dish up at the moment? At the moment we are doing ceviche snapper tostadas with a coconut guacamole, seaweed salsa verde, coriander and lime. It is using fresh, locally-caught fish, South Beach seaweed, and the combo of lime, coconut and salt makes it taste very coastal. So fresh, clean and simple… but perfect! Best place to get a healthy treat in Perth (besides your food truck, of course)? There is a new juice and smoothie bar on Wray Avenue in Fremantle called Roots & Greens. Their drinks are the best way to start a busy day, and so tasty. We reckon they must use great quality produce in their food and drinks, because you always leave there on a natural buzz. For guys like us who are always on the move, its great to be able to get all that goodness in an easy drink. What’s next on the horizon for Eat No Evil? That’s a hard one too. We don’t really have an end goal with this, we’re just enjoying this amazing ride. We’re always heading in new directions that keep us stimulated, and we would like to keep growing the business while keeping focused on the product—fresh, delicious, healthy food. Who knows, maybe one day a tiki tostada bar on the beach could be the next addition to the Eat No Evil family? Want to read up on more Perth health and fitness junkies? Search 'Meet The Health Nut' In The Directory!